Two guitars, one ukulele, four djembes, a tambourine, a couple of sets of Boom whackers, and two Tibetan singing bowls—these are among the instruments that showed up in my backyard this summer for our annual family-and-friends-Fourth-of-July picnic. As you can imagine, amazing sounds issued forth from various combinations of instruments (and would-be instruments) played by various combinations of musicians (and would-be musicians) whose ages spanned seven decades. I loved all the music that was made over the course of the day, but particularly moving to me was my experience with the Tibetan singing bowls, also known as “Himalayan bowls” or just plain “singing bowls.” If you have ever watched someone “play” a bowl, you know the magical sound that can result when, by the action of running a wooden dowel around the bowl’s rim with just the right amount of pressure, the “voice” of the bowl is set free. 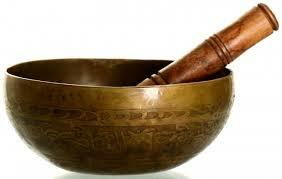 A cousin once gave me two brass bowls he had bought on his travels around the world. One at a time, he had collected a set that, when struck with a mallet, produced the sounds of an octave. With an overtone of apology, he told me that the bowls he was giving me were not as resonant as his other bowls and that they did not fit in with the octave the others produced. For those reasons—defects, really, in his eyes—he was willing to part with them. Still, they were lovely to look at, and I received them gratefully. For more than forty years I have kept those bowls, mostly using them to hold things—votive candles, small flower arrangements, thumb tacks. Not until I watched Jan and Lauren play their bowls in my yard did it occur to me to wonder: Despite my cousin’s disparaging remarks, did they in fact have a voice he had not discovered? Could they be played another way? Might they be singing bowls? I went to get them. With great curiosity, I watched as Jan held one in the palm of her hand and began running a mallet around its rim. With even greater amazement, I listened as its voice emerged and came into fullness. It sang a strong, clear song, one rich with complex harmonics. Wow. How long had that bowl been waiting for its voice to be set free? You probably know where I am going with this. Sometimes we are so convinced that we cannot do something that we don’t even look at all the options. Sometimes we think we have no voice—when in fact we each have one that is clear and strong and rich. My prayer this week is that we not remain content simply to hold things—but that we let the spirit of love and hope and possibility play in us, freeing our voices, releasing our songs.